A few days ago, en route to work, I spotted firemen at Cité U. Normally, they can be seen during sunny weekend morning playing baseball at the pitch, but on a weekday morning, that could only mean trouble. Sure enough, I looked up at the building next to where they were and big gaping holes with black charred beams were staring back at me. Ooops. 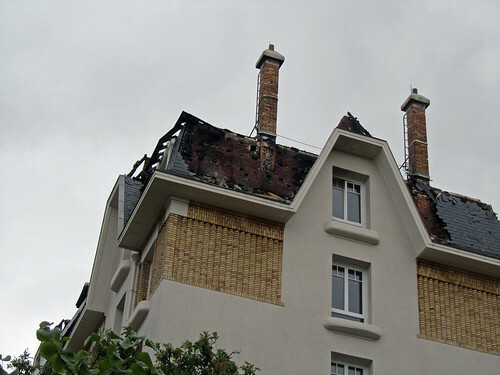 The fire broke out on the night before (and nope, I didn’t hear any siren even though my building is not too far from it) and has ravaged through the roof of that particular wing. A video that I found online showed it to be a pretty huge fire although well-contained that it didn’t spread further. For now, the residents of the building have been temporarily housed elsewhere in Cité U.